HeartFire Media created a campaign in conjunction with SAMMinistries modeled by the idea of Alex, a young girl whose generosity inspired her to give one of her Christmas presents to a child living at SAMMinistries. 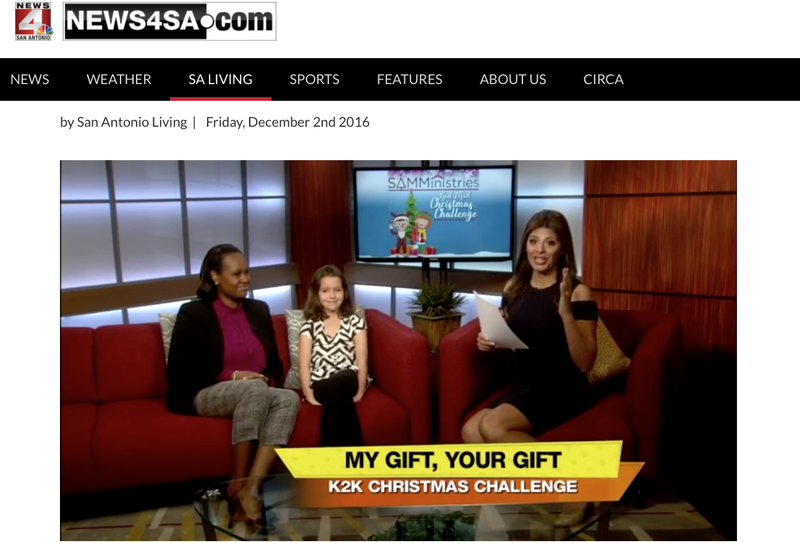 CEO, Samantha Najera was inspired and created the Kid2Kid Christmas Challenge that would ask local kids to just the same as Alex did, to give up one of their gifts, or make a monetary donation of their own. The message and goal of the campaign is not only to get other children and families excited about sharing their gifts but to also increase community involvement with SAMMinistries during the holiday season. Launched in 2016, with social media and news coverage, SAMMinistries gained not only publicity but most importantly a gained increase number of volunteers and gift donations. Children, parents, and families took the challenge, donated gifts, and in the end received a gift back that was priceless…a happy heart filled with joy. Sam, do we have numbers on the increase of volunteers and how much they got in gift donations? Great, so just to clarify… the campaign is titled ” Kid 2 Kid Christmas Challenge” and we will use the hashtag #MyGiftYourGift and every so often #SAMMinistries #EndChildHomelessness, correct?